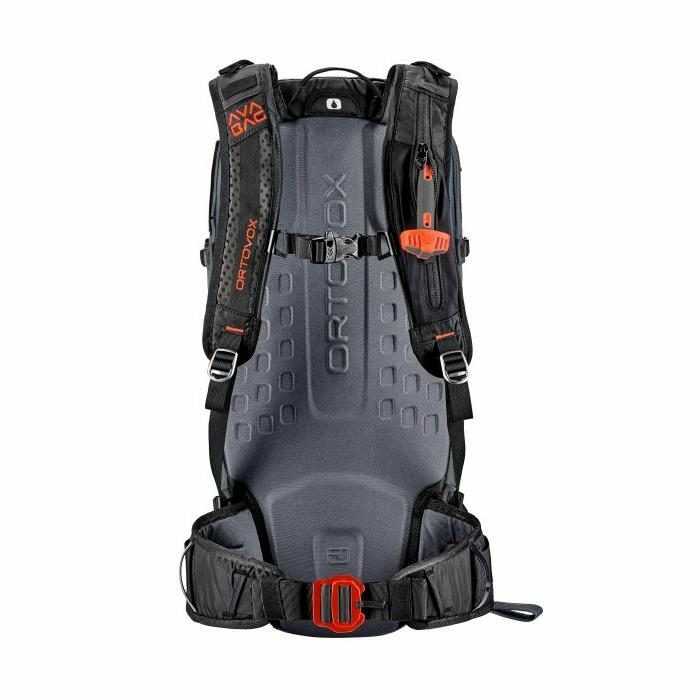 The Large Upper Compartment along with 2 safety compartments where you can stow warm extra layers, spare goggles and a First aid kit. The additional compartments can be used to store valuables. 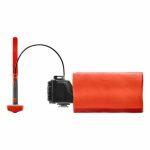 Indicated Shovel and Probe Pockets allowing easy and convenient storage. The pack contains an Emergency Card, allowing you to complete and store your personal information in the event of an emergency. 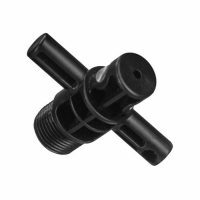 Circumferential Zipper allows rapid access to the entire contents of the main compartment through the convenient front access. The Helmet Net is a removable net for convenient and secure fastening of a helmet, which can also be used in combination with attached skis. 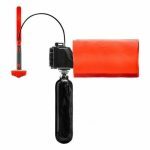 Rope Attachment is a simple attachment allowing immediate access without having to open the cover. 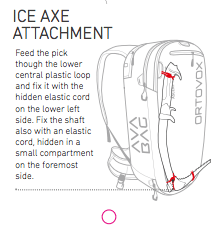 Ice Axe and Hiking Pole Fastening, you can attach the shovel to the front of your bag to allow more room inside. 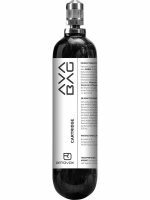 Due to the moisture, the Waterproof Zippers will prevent any of your avy essentials becoming damp. 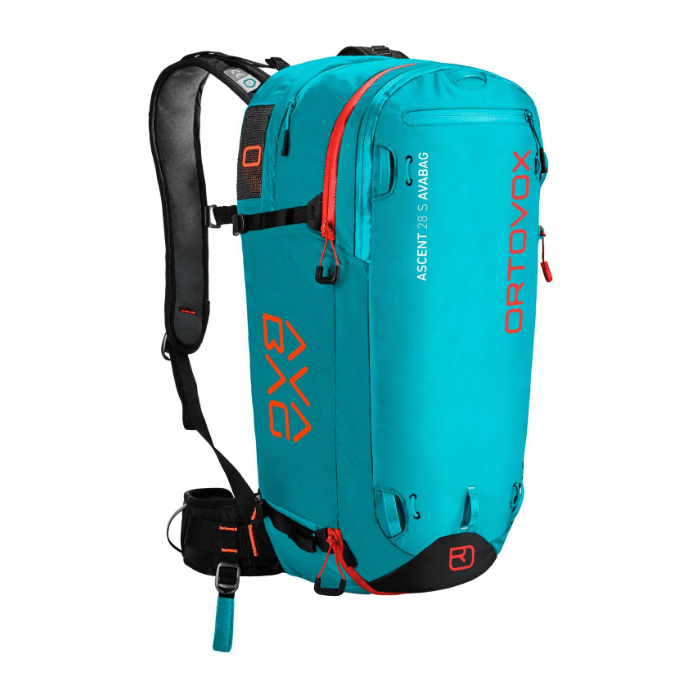 The Ortovox Ascent 28 S Avabag is the ideal companion for demanding ascents and powder descents. 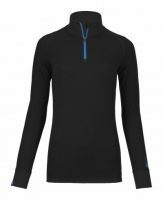 Ascent means the total emphasis on function and protection while being light and extremely comfortable to wear. The Ortovox Ascent 28 S Avabag was built to accommodate a women's figure, This ski touring backpack has a shorter back system than the regular ascent range meaning the hip and shoulder straps have been adapted in a way to suit the female anatomy. To determine your back length, use a tape measure to measure yourself from the top of your hip bone to the very top of your back just before the neck. 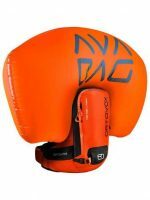 Use the size guide image in the image gallery to calculate your size. 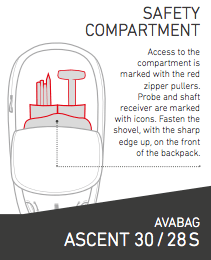 Safety compartment: Access to the compartment is marked with the red zipper pullers. Probe and shaft receiver are marked with icons. Place the shovel blade with the sharp edge up. 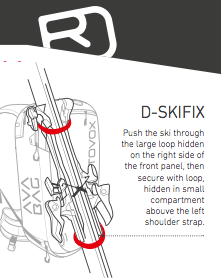 D-Skifix: A fast and safe diagonal ski fastener that offers plenty of wear comfort. 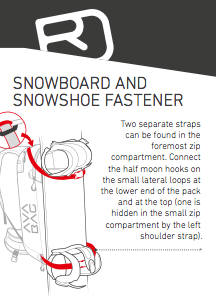 Snowboard and Snowshoe attachment: Connect the lower straps with the metal nose and the small lop above the icon compartment. 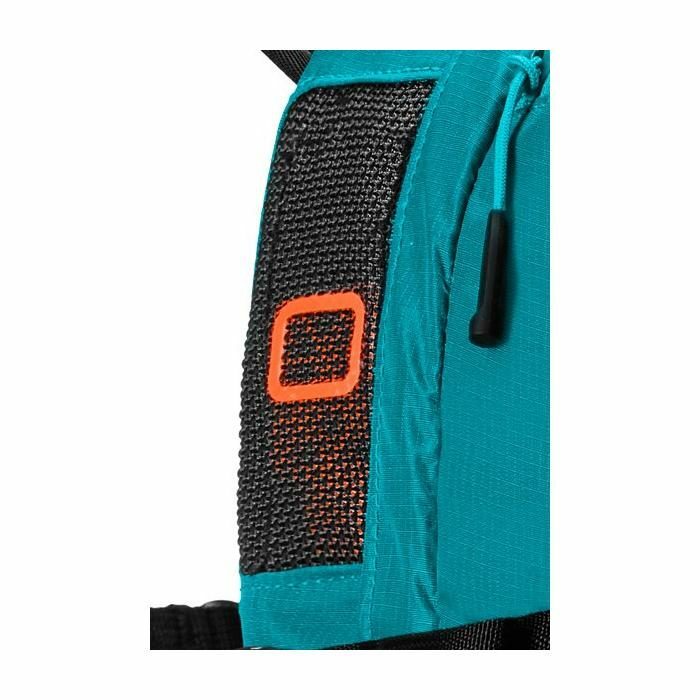 The upper part can be found in the compartment above the left shoulder strap. Disconnect the metal half-moon hook and feed it through the loop by the right shoulder strap. Fit the board / Snowshoes and close the buckle. Chest strap with a signal whistle: Quickly draw attention in emergency situations. Emergency Card: Quick access to emergency details if stuck in an avalanche situation. 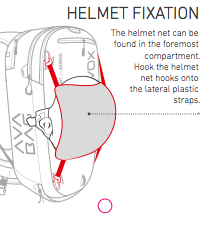 Helmet net: Fixed in a zipped compartment, optimized fastening. Water-resistant zipper: Repelling moisture for secure and dry contents. 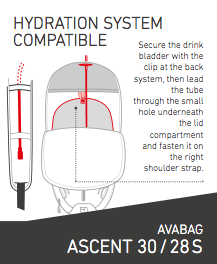 Hydration system compatible: Push drink bladder into the slot on the carry system interior and secure with strap and flat-front buckle. Lead the tube through the outlet by the right shoulder strap and fix it with the rubber band. 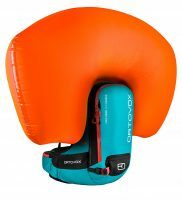 Bright inside: Light Colours inside make it easier to find your avalanche safety equipment. 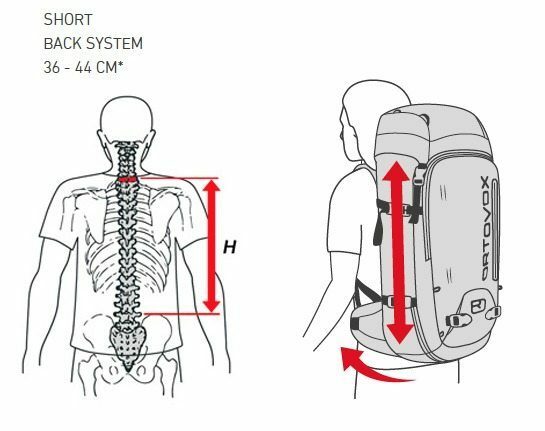 Snowboard and snowshoe attachment: optimized, complete transport aid. 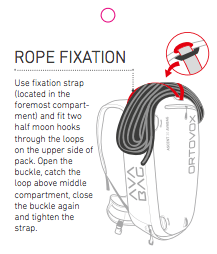 Rope Fixation: Use fixation strap (located in the foremost compartment) and fit two half-moon hooks through the loops on the upper side of the pack. Open the buckle, catch the plastic loop above the middle compartment, close the buckle again and tighten the strap. Illustration of alpine emergency signals: Print (inside) shows you signals for emergencies. Ice Axe and Hiking pole loops: Place the pick of the Axe or Hiking pole into the icon compartment and fix it by closing the straps. Then attach the shaft by using the elastic cords, hidden in the two small compartments near the foremost zipper. 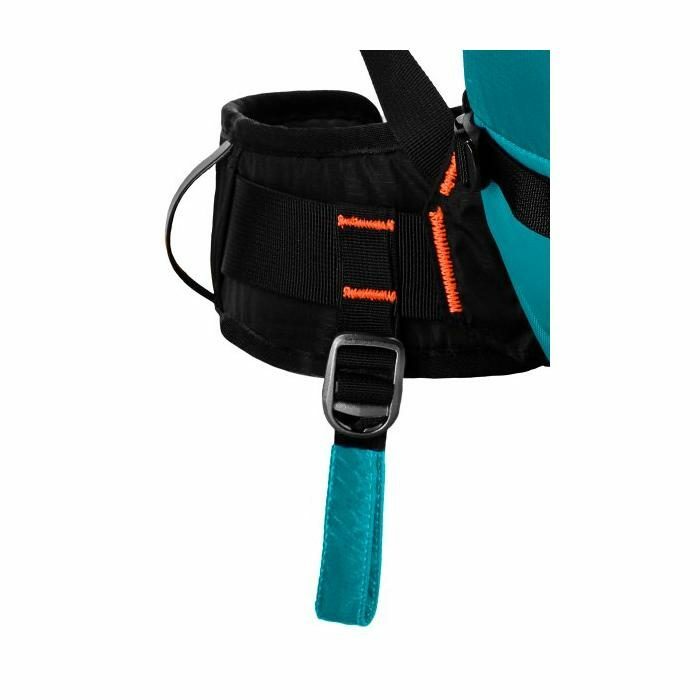 Safety Leg Strap: for the highest possible safety in the event of an avalanche. What are the major differences between the Ortovox Ascent and the Ortovox Freerider?